Shawn Christopher was charged with three counts of criminal animal neglect after his pit bulls were found with severe injuries in his home. A tip to the Animal Crimes Unit in Nassau County has led to not only the arrest of a Roosevelt man, but also a dual rehabilitation effort between the Hempstead and North Shore animal shelters. According to District Attorney Kathleen Rice, 41-year-old Shawn Christopher severely neglected and abused his pit bulls. When the NCPD DA Squad and the NCDA ACU arrived at the Roosevelt resident’s home on November 7th, they found the pets with blistered skin, bloody raw open sores, cracked paws, and severe swelling to their face and eyes. Detectives say the two other puppies at the scene had similar injuries. The three pit bulls were taken by Animal Control and sent to the Town of Hempstead Animal Shelter in Wantagh. Veterinary examinations found they had advanced stages of mange that went untreated for months. 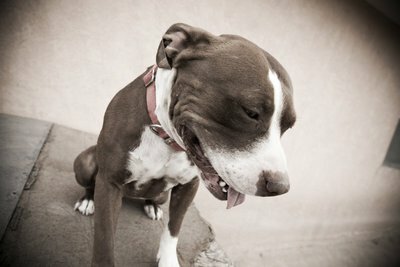 The pit bulls are currently under the care of the North Shore Animal League. Hopefully they’ll make a speedy recovery and one day find a loving home. Christopher was arraigned on three counts of Criminal Animal Neglect, and one count of Criminal Possession of marijuana in the Fourth Degree. He has since been released to probation and is due back in court on January 16th, 2014. The maximum sentence for each count is up to one year in jail. D.A. Rice started a Nassau wide Council on Animal Protection & Safety earlier this month to provide a forum for instances such as this one. Now because of this, the public can report animal cruelty one of four ways. The first is by walking to the DA’s Criminal Complaint Unit at 272 Old Country Road. The next is by calling the D.A.’s Animal Crimes Tip Line at (516) 571-2245. You can also file complaints online at www.nassauda.org, or by email to AnimalCrimesUnit@nassauda.org. For cases considered imminent danger, immediately dial 911. Subject: LongIsland.com - Your Name sent you Article details of "Pit Bulls Saved After Tip to ACU Led to Roosevelt Man’s Arrest"